We awoke early, too early. We had given ourselves an excessive amount of time to get breakfasted before our train and ended up hanging around the station for over an hour. We did our best to get rid of as much remaining Czech currency as we could and then boarded the train and prepared ourselves for the journey ahead. A lot of reading was done and much music was listened to and we had a pretty alright time across the eight hours. On our eventual arrival in Warsaw David and I were greeted with towering walls of concrete on every side which in comparison to many of our previous destinations left a lot to be desired. We were then graced with the Palace of Culture and Science which was a gift to the city from Stalin which was a fairly unique site within the city and seemingly Europe. 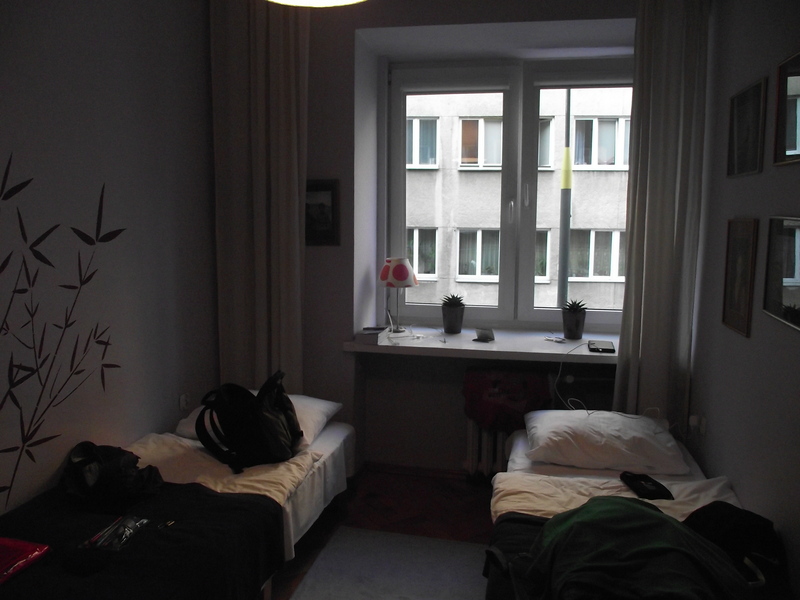 We awoke feeling slightly groggy and eventually made our way out of the hostel and into the city. We first stopped at the tomb of the unknown soldier and we spent a bit of time discussing whether it was actually an original feature or if it had been designed to look like it had been partially destroyed. We then headed into the Old Town, which had been lovingly reconstructed after the Nazi’s had destroyed 80% of the city. It sits in stark contrast to the rest of the city and it leaves you wondering how the city could have looked. We then walked on to the Warsaw Rising Monument which commemorates those who fought and died in trying to free the city from Nazi occupation. We stopped for a while after this, to “enjoy” a “burger”. We then continued our trail of monuments coming to the Jewish Ghetto Monument which was completely destroyed by the Nazi’s following an uprising within it’s walls. 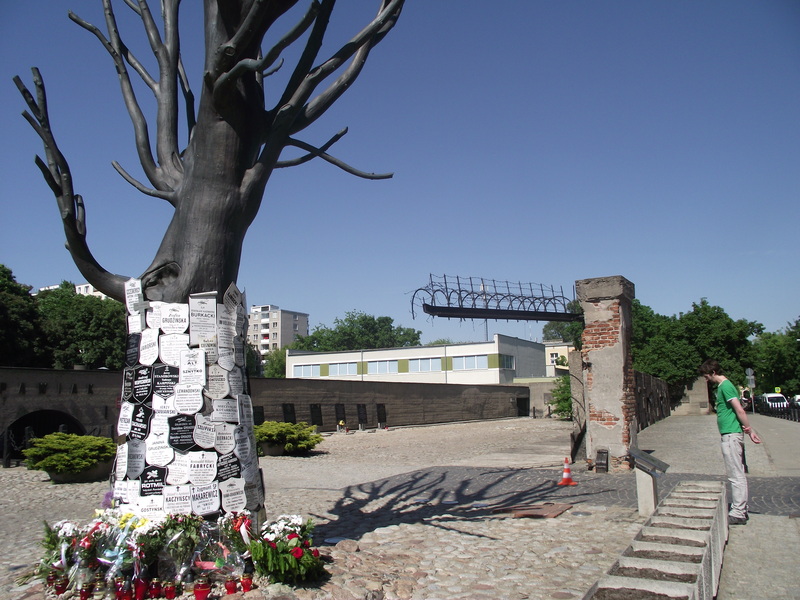 Nearby are the remains of the Pawiak Prison which formed part of the Warsaw concentration camp before also being destroyed after the attempted uprising. We then continued in an attempt to find the Warsaw Rising Museum and after a little confusion, we found it only to be further confused. The museum itself houses a lot of information on the people and the events of the Warsaw Rising but it is so difficult to navigate in a chronological order that I often became confused as to what had happened when. 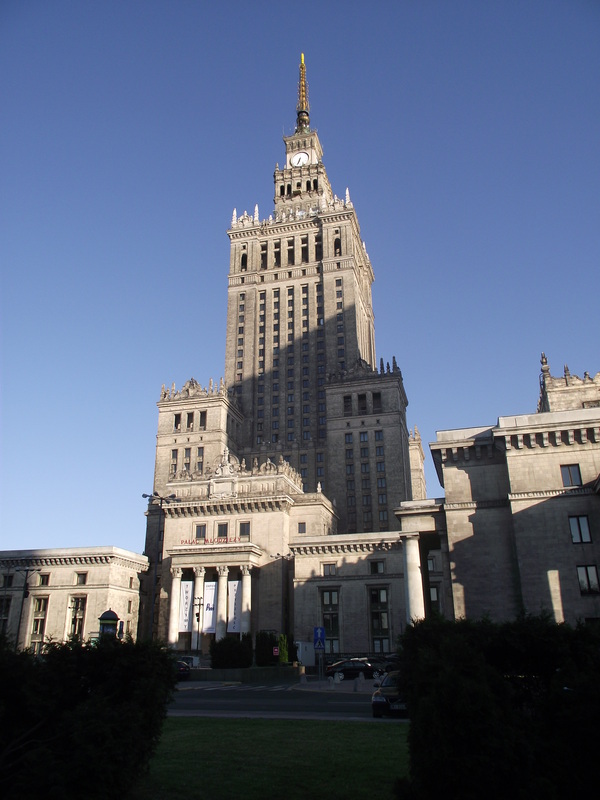 We eventually found our way out of the museum and returned to the city centre, using the Palace of Culture and Science as our guide and returned to the hostel. On this occasion we didn’t bother to ask for a recommendation and just headed onto the high street near the hostel and ended up with Polish menus and were forced to play it safe and order a steak, although this was what we had actually gone in to said restaurant for anyway. We were however delighted to find that we could order pitchers of beer which once again lead to the likelihood of another hazy start. It won’t come as a surprise to find that we took a leisurely approach to checking out of Warsaw, checking out just in time. We found our way back to the station and onto the next train to Krakow and were shocked and impressed to find that the Polish rail company offered a complimentary hot drink, and after our attempts at refusal and the stewardess’ insistence we had a very free tasting coffee. 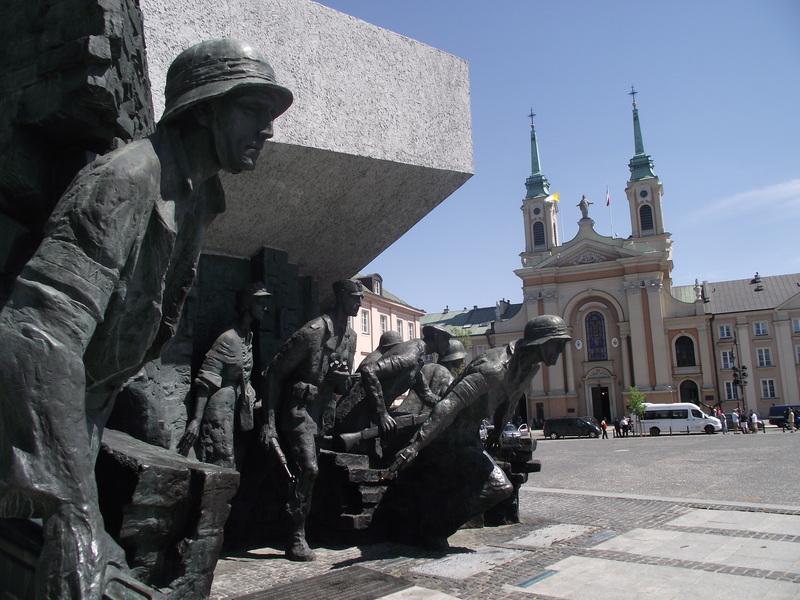 we then arrived in the city which looked like it had avoided a similar fate to Warsaw as the concrete was limited and the older buildings around the centre gave the city a much nicer look and feel. We shortly arrived at our hostel and spent the afternoon chilling out and trying to get up to date with things and get more destinations booked. In the evening we headed into the city where I discovered a love for chicken stuffed with blue cheese and made attempts to convince David that he doesn’t have free will. As the drinks flowed on the conversation began to slow and we decided to head back to the hostel and enjoy the lighter entertainment of music. The next morning we awoke to torrential rain which wrote off much of the day. We managed to get more planning done and had extended our trip as far as Greece before heading out into the weather in the hope that it would ease off if we were confident enough about it. We were shortly driven into a cafe, and after one latte each we were convinced the weather would have cleared but to no avail. 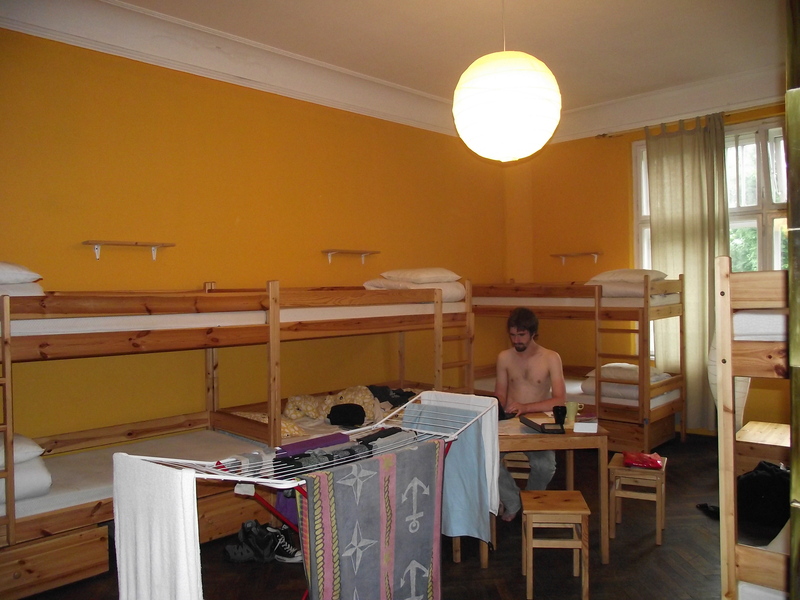 We then returned to the hostel and spent the afternoon sorting out laundry and cleaning ourselves up a bit. Fortunately, we had what I had designated as a “spare-day” in Krakow and we had to hope that the weather would improve for the following two days. David then reminded me that it was the Champions League Final, and that his beloved Manchester United might happen to beat Barcelona so we headed out and found that the rain had finally ceased. After checking a few places we found a small restaurant that was showing the game on one of it’s walls and we enjoyed food washed down with litres of beer which turned out to be a slight disaster as they were continuously being ordered throughout the game and we found ourselves incredibly drunk by the time we left. When we eventually woke up the following morning we found glorious sunshine and relatively light hangovers. We got ourselves together and headed out in search of the perfect cure; a kebab. We then explored much of the Old Town before heading to Wawel Hill, the main tourist sight in Krakow which towers over the city and houses a castle, cathedral and several of the cities museums. After spending a lot of time within the castle walls, we returned to the city centre past some of the old walls and through an old city gate. David had then suggested that we check out a traditional Polish restaurant where we enjoyed an incredible beetroot soup and generous helpings of rice and meat wrapped in cabbage and pork roulade. For ever let this place be a cry of despair and a warning to humanity. 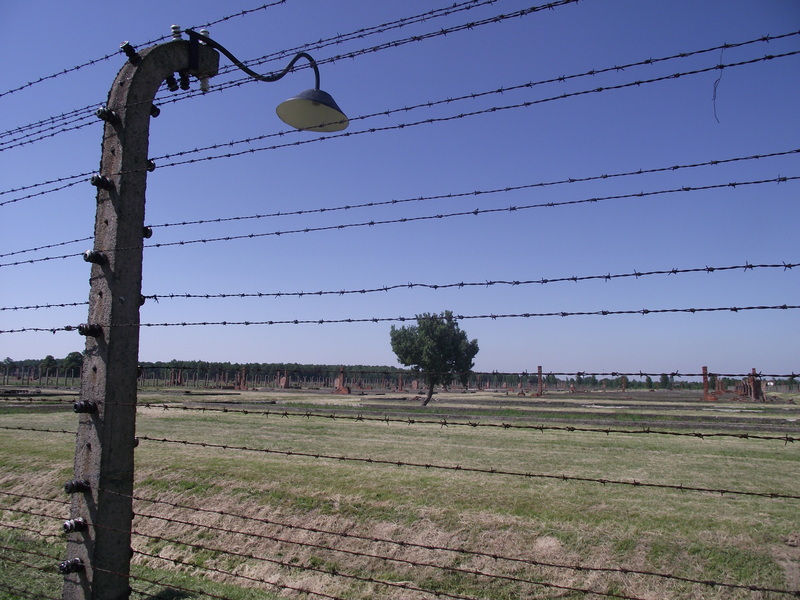 There are no words that will ever do justice to the mixture of emotions that came over me when I was in Auschwitz. It is a place that really needs to be seen first hand to have any limited understanding of the horrors that were committed there.